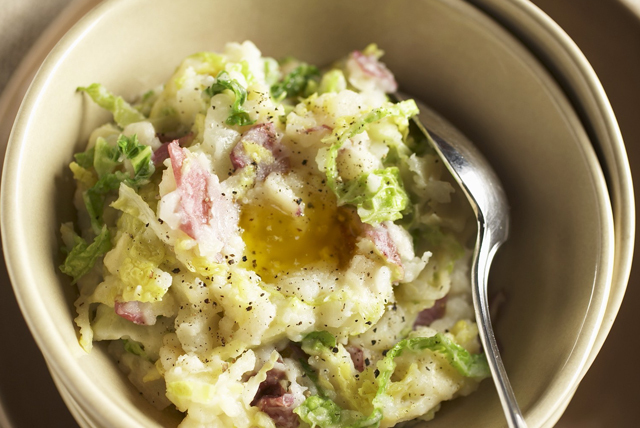 Based on the Irish recipe colcannon, this easy-to-make version is a heavenly combination of potatoes and cabbage all mixed together with cream cheese, mozza-cheddar and bacon. This comforting potato side is the perfect dish to serve on a cool night. Why wait? Try this cheesy potato and cabbage mash recipe tonight! Place cabbage in microwaveable bowl. Add enough water to cover cabbage; cover with paper towel. Microwave on HIGH 3 to 4 min. or until cabbage is tender; drain. Drain potatoes; return to pan. Add cream cheese product, shredded cheese and milk; mash until potatoes are smooth and mixture is well blended. Stir in bacon and cabbage. Substitute 1/4 cup Oscar Mayer Real Bacon Bits for the chopped bacon. While we love the addition of the cabbage to these creamy mashed potatoes, this potato side dish is equally delicious without the cabbage.